Mammography is the single most effective method of early detection of breast cancer. It can identify cancer several years before physical symptoms develop. Cancer treatment is more successful when cancer is discovered early. Mammography is a low-dose x-ray procedure that allows visualization of the internal structure of the breast. On average, mammography will detect about 80-90% of breast cancers in women without symptoms. Our hospital utilizes a CAD (computer-aided detection) system which helps the radiologist identify suspicious breast tissue so that it can be further evaluated. It is especially important that women receive regular mammograms, in fact it is recommended by the American Cancer Society that a screening mammogram be done every year beginning at age 40. 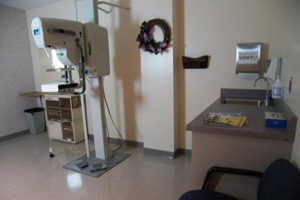 The Women's Imaging Center at AVRMC offers mammography in a gentle, quiet atmosphere. We are certified providers of the MammoPad which is a soft foam cushion provided for each patients use during their mammogram. We are located to the north of the main elevators and our entrance is in the main hallway of the hospital. When scheduling, avoid making your appointment for the week prior to starting menstrual cycle since breasts are usually more tender. Avoid caffeine for a couple of days before your test. Caffeine causes you to retain fluid and can make the exam a little more uncomfortable. Consider taking NSAID (non-steroidal anti-inflammatory drug) such as Advil, Aspirin, or Ibuprofen for extreme breast tenderness. Be sure to wear a comfortable two-piece outfit that is easy to change out of. If you have had previous mammograms at other facilities, make sure that you have contacted them to send your mammograms to our facility so that they can be compared. Don't wear deodorant, body glitter, powders or lotions. You may feel pressure and perhaps some discomfort. The most important thing you can do is to relax your muscles and cooperate with the technologist when she is positioning your breast. The level of radiation is no more than what you are exposed to on a commercial air flight. I'm afraid they will find something! Finding cancer early is far better than the pain, discomfort and cost of treating later stages of cancers. The female technologists have been trained to minimize embarrassment for you. There are supplemental programs to assist those who can't afford the cost.